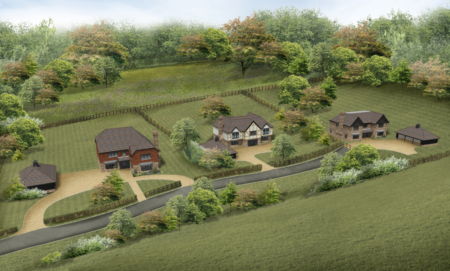 Planning permission has been granted for a stunning new development of three large, detached dwellings on brownfield land between Cranbrook and Tenterden under Ashford Borough Council. Patrick Durr Associates was instructed by the applicant to undertake a site assessment and investigate if any new development was possible at the site, which was an unsightly brownfield site with commercial and agricultural uses. Following the site visit and extensive research, we were able to propose a Lawful Development Certificate confirming the use of a dwelling on site, and two Class Q Prior Approval applications proposing conversion of an agricultural building to two residential units. These three applications were thankfully approved. The Class Q applications did raise a small number of queries, but these were comprehensively answered using knowledge of the statutory instruments and evidence available from the applicant. With the three approved applications, in planning terms we believed this to equate to three residential units of which we could then propose a new build development, which made better use of the site and would improve the area as a whole. Subsequently, we undertook a successful pre-application meeting with the Council and instructed both bat and Great Crested Newt surveys. This culminated in us proposing three new dwellings in lieu of the existing residential planning units approved. To better the application for the Council, we also sought to clear the entire site and trade any other development at the property for the dwellings, and several acres of ecological enhancements. These ecological enhancements, designed by an ecologist, essentially proposed a private nature reserve which would protect the site for the long term future for the benefit of wildlife. Despite a drawn out planning application assessment, which saw the Council bring a number of small queries and also required us to make small amendments to the dwellings, we were thankfully provided planning permission for this fantastic development. The development is an excellent example of using planning to significantly enhance a site, and provide well-designed accommodation for both people and wildlife. Please Contact Patrick Durr Associates if you have a site with potential, and are hoping for an equally special scheme.